Shopping for Muppets Film Cells? Own a piece of The Muppet Movie! 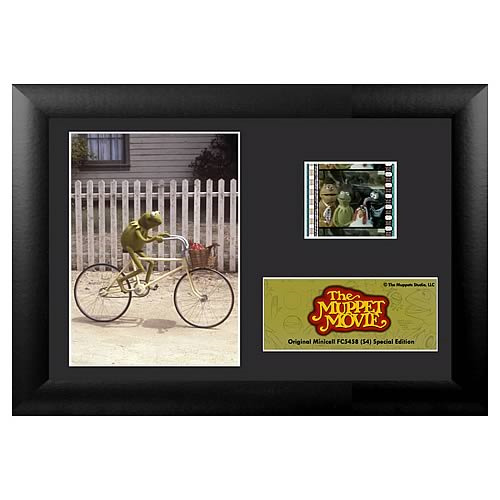 Features Kermit the Frog, beautifully mounted and framed! A must-have collectible direct from Kermit's swamp! This amazing film cell features prints and actual cells from The Muppet Movie. Measures 7 1/2-inches wide x 5 1/2-inches tall. Perfect for displaying in your home or at the office, all the elements are framed in black wood and includes a certificate of authenticity. They're irreverent, irrepressible, and downright irresistible. They're the Muppets, starring in their first full-length movie. See how their meteoric rise to fame and fortune began: with a rainbow, a song...and a Frog. After a fateful meeting with a big-time talent agent, Kermit the Frog heads for Hollywood dreaming of showbiz. Along the way, Fozzie Bear, the Great Gonzo, and the dazzling Miss Piggy join him in hopes of becoming film stars too. But all bets are off when Kermit falls into the clutches of Doc Hopper (Charles Durning), a fast-food mogul seeking to promote his French-fried frog-leg franchise!